Sweet and Savory Butter Madness! 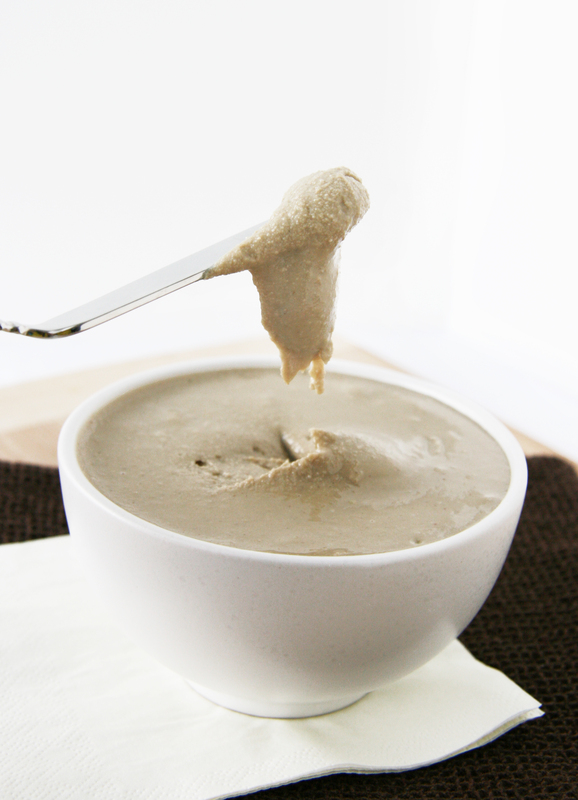 Since I’ve been a little behind the past several weeks with my kitchen experiments and dishes, I thought I’d share THREE recipes with you for homemade (dairy free) “butters”. 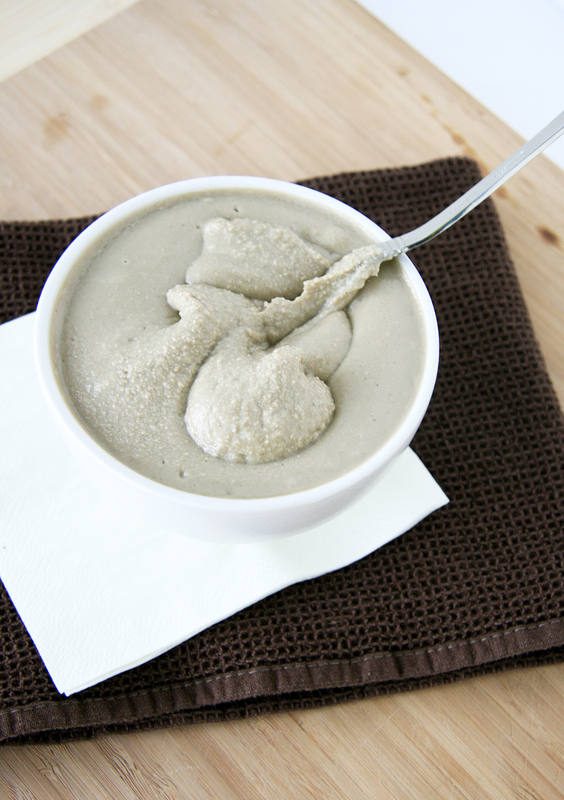 I LOVE nut butter/coconut butter/seed butters – I eat them by the spoonful or use them as toppings for both sweet and savory dishes or as dips or spreads. Needless to say, my food processor has been getting a workout these days! It’s officially my favorite kitchen appliance…oh wait, I do adore my toaster oven.. and my Magic Bullet…well, it’s definitely in my top 2 or 3.to the butters!First up is so simple and doesn’t require a recipe- homemade coconut butter. If you haven’t tasted coconut butter or you find the store brand so incredibly expensive ($9-11 per jar), you should give this a whirl (no pun intended).All you need is unsweetened, raw shredded coconut. I bought mine from NutsOnline so I know this brand works well. Buy the shredded coconut that doesn’t contain sulphur dioxide, it will turn into butter much quicker and you won’t be consuming preservatives.This is the basic step by step just like my homemade almond butter I made a while back. 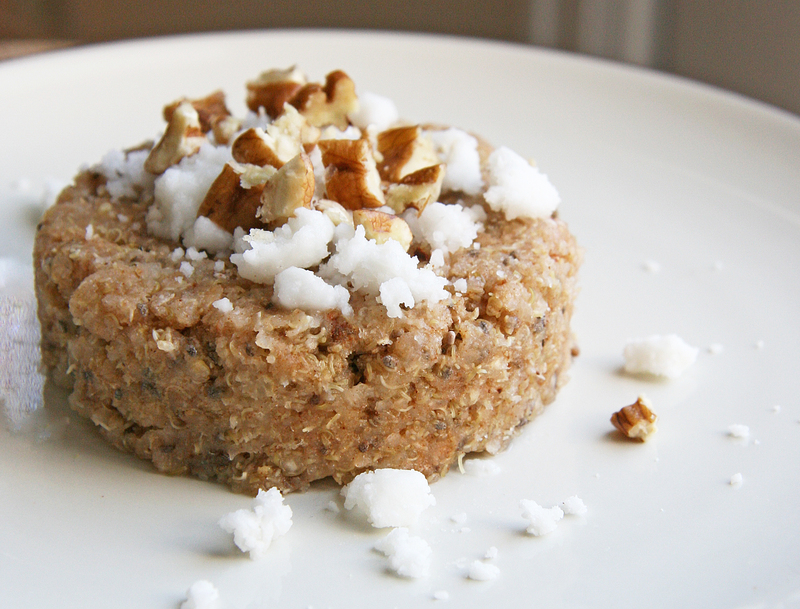 Nothing added, just coconut and a food processor (I have a KitchenAid)…and patience. It will turn into coconut butter but you will need to scrape down the sides with a spatula often, and repeat. 1. Add shredded coconut to bowl of food processor. Turn on the processor, stopping every so often to scrape the sides, turn back on and repeat until you have a creamy coconut butter (it took me about 13 minutes). Variations: I love the flavor of plain coconut butter but feel free to sweeten your butter with sweetener of choice, if desired (palm sugar, stevia, honey, agave etc). You can also flavor with vanilla, cinnamon, other spices etc to your liking. Coconut butter will solidify at room temperature and it keeps for a quite awhile. I flake mine and use it on top of muffins, baked goods, breakfast bakes, flake bakes, pancakes, waffles, oatmeal or you can even use it as a base for a healthy fudge! 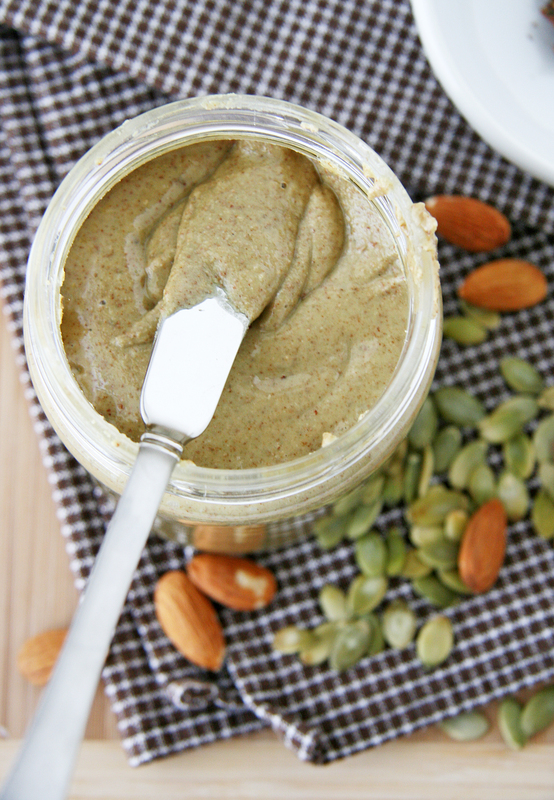 The second recipe is the one I’m most excited about — Almond-Pumpkin Seed Butter – it is DELICIOUS! I made 2 cups worth of this nut/seed butter a week ago and as of this morning, I am completely out. Obsessed much? Yes, I sure am! I saw a bag of raw pepitas (pumpkin seeds) on sale at Natural Grocers a couple weeks ago that I couldn’t pass up. I’ve toasted them and sprinkled on top of my feta honeydew and tomato salad, I’ve used them in granola and as a topping but I haven’t used pepitas in such a large quantity. Why not turn them into a seed butter? I had a couple cups of raw almonds lying around and thought they would make a good pair. After all, almonds are slightly sweet and would help off set a the greenish hue from the pepitas – it’s a match made in heaven! 1. Preheat oven to 170F and line a baking sheet with parchment or a silicon baking mat. Spread the almonds out onto the prepared baking sheet and bake for 40 minutes, stirring once half way through. * Remove from oven and let cool. 2. While almonds are baking, heat a dry large skillet over medium-high heat (no oil required). Add pepitas to pan and stir constantly with a wooden spoon or spatula until they are crackle, pop and are light brown on the edges (just a couple minutes). Be careful not to over toast or burn! Transfer to bowl of food processor and let them cool slightly. 3. Once almonds are mostly cool, add to the pepitas in the food processor. Turn on the processor, stopping every so often to scrape the sides, turn back on and repeat until you have a creamy almond-pepita butter (it took me about 9-10 minutes). Add salt and honey to taste and process again until well incorporated and try not to eat it all with a spoon enjoy! *You can use raw almonds and pepitas but I prefer the flavor of the roasted/toasted, and it helps bring out some of the oils to reduce time in the food processor. This recipe is featured at Marla’s Family Fresh Cooking blog at her Happy Post on Pumpkin Recipes this week! 3. Once almonds are mostly cool, add to the pepitas in the food processor. Turn on the processor, stopping every so often to scrape the sides, turn back on and repeat until you have a creamy almond-pepita butter (it took me about 9-10 minutes). Add garam masala, salt and honey to taste and process again until well incorporated and enjoy! Serve this savory nut butter with toast, bread, my grain-free seed crackers, sauteed veggies/meat, celery, carrots, apple (for a sweet/savory mix), baked sweet potato (if you ever tried PB and sweet potato, it’s AMAZING), over cooked lentils, in a curry or straight from the jar! The first time I tried Sunbutter, I had the impression it was going to be exactly like peanut butter since I’d been told it was the best replacement for those with peanut allergies. Though I found sunflower seed butter has a slight bitterness over PB but does has a wonderful depth of flavor that holds a special place in my heart and fridge. My inital attempt at homemade sunflower seed butter was a fail, as I thought it was going to automatically would turn into butter without any additions…but after 30 minutes and it still being chunky, I knew I needed to help it along. I added tasteless, refined coconut oil but any neutral tasting oil works here. A few tablespoons made a big difference! It’s yummy unsweetened with a bit of salt but my preference is slightly sweetened, it’s up to you! The bit of sweet spices (cinnamon etc) would be a wonderful addition as well. 1. For toasted version, add sunflower seeds to a large skillet over medium-high heat. 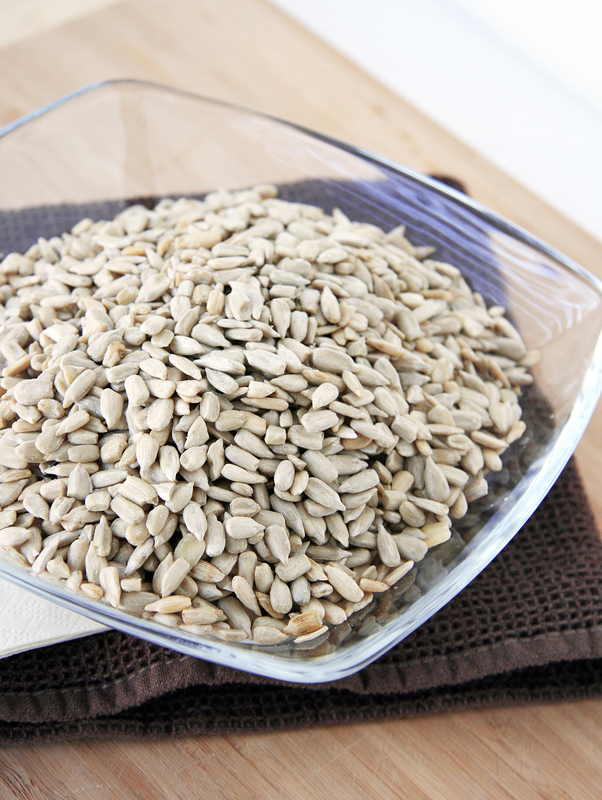 Stir constantly until sunflower seeds are lightly golden brown and toasted (just a couple minutes). Watch carefully or they will burn! Transfer to a bowl and let cool. 2. Add sunflower seeds to bowl of food processor and turn power on. Process until turns into a powder and then while processor is on, slowly pour in oil until the mixture transforms from a chunky meal into a creamy butter. 3. Add salt and sweetener if desired. Lick spoon and bowl of processor and enjoy! I transferred the sunflower seed butter into a food-safe container and stored in the fridge. Due to the coconut oil, it will not be a drippy butter but you can set it out at room temperature or spread it on warm toast/bakes/oatmeal etc and it will melt slightly. You can use just like peanut butter as a sandwich filling, in desserts, in stir fries, or as a dip for fruit slices or crudites – Delicious! Wow – those looks so good! I’m especially eyeing the pumpkin seed almond one in the middle. 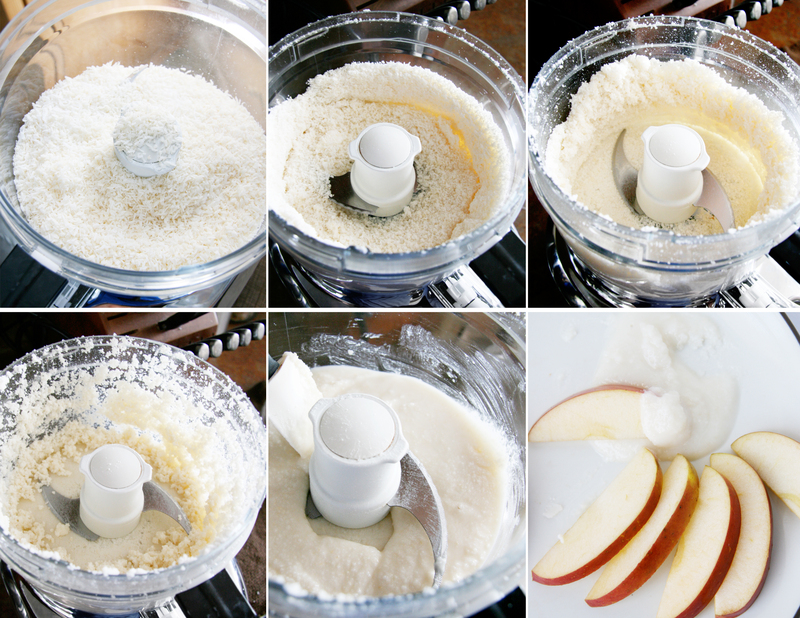 What kind of food processor do you have? Mine burnt out after chopping vegetables!! woops just read the post over more carefully =P KitchenAid, got it! What, are you insane??? As if a post featuring ONE nut butter recipe wasn’t enough, you had to include SEVERAL under one single click? OMG, you can’t do that! 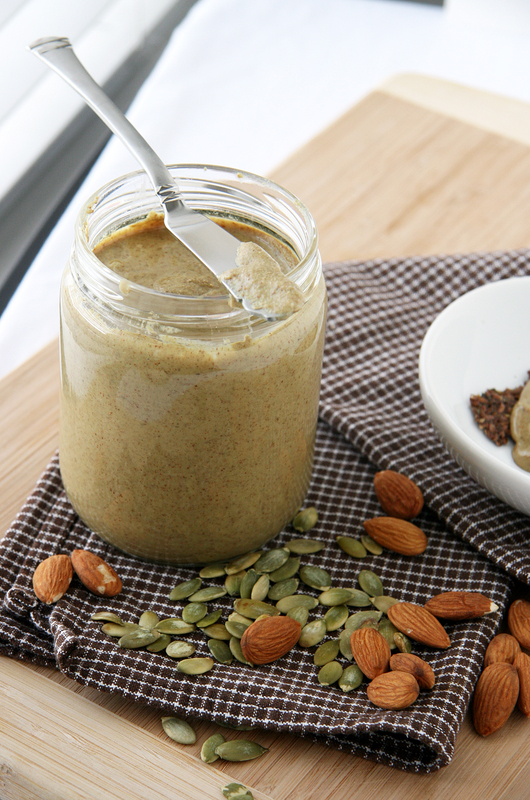 That’s it, I’m not looking, I am moving on to another post… moving on… but… wait… that roasted almond pumpkin seed butter looks pretty darn good… That’s it! You got my brain’s attention, now he wants to check out the recipe. I think you would love the pumpkin seed-almond version, it doesn’t need any sweetener but it takes it over the edge – the addition of flax and vanilla would be divine. The garam masala adds a sweetness from the cinnamon, cloves and cardamom but a very slight savoriness that goes well with sweet dishes as well – oh how I love spices! 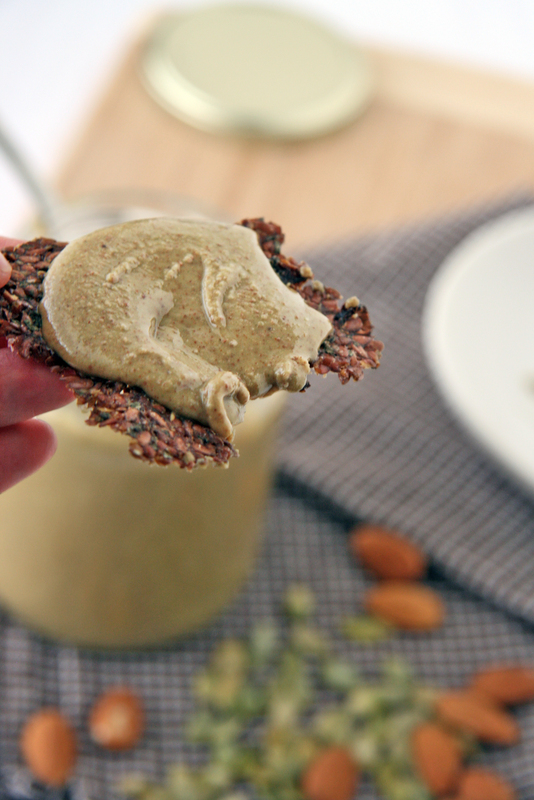 There are so many amazing ways I can use this nut butter! Thanks for the invite Marla! I will be making more pumpkin goodies soon – can’t wait! I have a nut butter addiction, and I’ve never thought of doing pumpkin seeds! I love that idea, I’ll definitely be trying it!! Love making it savory too, so yummy sounding. Yum! What a great idea to spice up pumpkin butter (love the idea of chia almond butter). Wonderful tips and recipes!! Thanks Tiffany! Homemade butters are the best 🙂 Which reminds me, I ran out of this butter a couple weeks ago after making several batches…I must make this again soon! Your style is really unique compared to other folks I’ve read stuff from. Thanks for posting when you have the opportunity, Guess I will just bookmark this web site. Great info. Lucky me I discovered your website by chance (stumbleupon). I’ve saved it for later! Hello All 🙂 So I’ve made up a lovely BIG batch of butters yesterday (coconut / brazil nut / hazelnut – which choc!!) and I’m curious to know what the difference between coconut butter and coconut oil is. They seem really similar to me…………..?? Hi Claire! Sounds like you love butters as much as I do! 🙂 Coconut butter includes the actual coconut meat whereas the coconut oil is just the oil. Hope that helps! Just made the toasted sunflower seed butter today and can’t wait to make the pumpkin seed butter soon! Thanks!! Pingback: 7 Healthy Ways to Enjoy Pumpkin Seeds This Fall [RECIPES] | Everyfoodrecipes, cooking tips, and how-to food videos—all rated and reviewed by millions of home cooks,make the perfect birthday cake, or plan your next holiday dinner. Can you soak and sprout your nuts?